(1) Officers Insignia of rank. Non-subdued insignia will be worn centered on both shoulder loops of the coat, 5/8″ from the outside shoulder seam. Enlisted Insignia of rank. Non-subdued insignia will be worn centered on both shoulder loops of the coat, so that the insignia will be centered between the bottom of the button hole and the top of the shoulder seam. The top of enlisted insignia will point toward the individual’s neck. (2) Torch of Knowledge. This insignia is worn by enlisted cadets centered on both collars parallel to the inside edge of each lapel with the outside edge of the insignia positioned 1 inch above the notch of the lapel for males, 5/8″ for females. (3) R.O.T.C. Initials. This insignia is worn by Officer cadets centered on both lapels of the coat, parallel to the inside edge of each lapel. The lower edge of the insignia is positioned 5/8 inch above the notch of the lapel. (4) Branch Insignia. Officer’s wear torches centered on both lapels, 1 1/4 inches below the ROTC initials, with the torches bisecting the ROTC initials and parallel to the inside edge of the lapel. (a) Male cadets. The nameplate will be worn on the flap of the right breast pocket, centered from left to right and between the top of the button and the top of the pocket on the Army blue 415 shirts and the coat of the Army blue uniform. (b) Female cadets. On the Army blue uniform, the nameplate will be worn between 1 to 2 inches above the top button on the Army blue 415 shirts and the coat of the Army blue uniform, centered horizontally on the wearer’s right side. Placement of the nameplate may be adjusted to conform to individual figure differences. (6) Ribbons. Only authorized ribbons will be worn. The order of precedence is found at the “Cadet Awards” page. Ribbons will be worn in the order of precedence from the wearer’s s right to left in one or more rows either with no space or a 1/8 inch space between rows. No more than four (4) ribbons will be worn in any one row. Male personnel will wear their ribbons centered 1/8 inch above the left breast pocket in as many rows as necessary. Female personnel will wear them centered on the left side with the bottom row positioned parallel to the bottom edge of the name plate. Placement of the ribbons may be adjusted to conform to the individual’s figure differences. (7) Other Insignia, Badges and Tabs. See CCR 670-1 and AR 670-1 for instruction on wear. blue shirt, short and long sleeve. The short and long sleeve shirt can only be worn with the necktie or neck tab. Name plate and cloth shoulder boards with embroidered cadet rank will be worn on both uniform shirts. b. blue shirt, short and long sleeve. The short sleeve shirt can be worn with or without the necktie or neck tab. The long sleeve shirt can only be worn with the necktie or neck tab. Name plate and cloth shoulder boards with embroidered cadet rank will be worn on both uniform shirts. Ribbons may be worn. (1) Uniform coats and jackets (male and female). 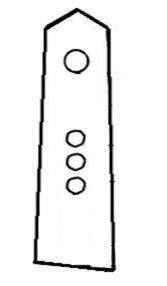 The sleeve length will be 1 inch below the bottom of the wrist bone. (a) Trousers are to be fitted and worn with the lower edge of the waistband at the top of the hipbone, plus or minus 1/2 inch. The front crease of the trousers will reach the top of the instep and be cut on a diagonal line to reach a point approximately midway between the top of the heel and the top of the standard shoe in the back. The trousers may have a slight break in the front. (b) Slacks will be fitted and worn so that the center of the waistband is at the natural waistline. The front crease of the slacks will reach the top of the instep and be cut on a diagonal line to reach a point approximately midway between the top of the heel and the top of the standard shoe in the back. The slacks may have a slight break in the front. (3) Knee-length skirts and dresses. Skirt and dress lengths will not be more than 1 inch above or 2 inches below the crease in the back of the knee. (4) Long sleeve shirts. The sleeve length will extend to the center of the wrist bone. (5) Other. Appropriate undergarments will be worn with all uniforms.